The Spanish bank won an auction for the bailed-out Catalunya Banc. BBVA was willing to sacrifice 55 basis points off its capital ratio to double market share in rich Catalonia. The price reflects government guarantees, and confidence that banks have turned the corner. Two women walk past a BBVA bank branch in Madrid October 11, 2013. 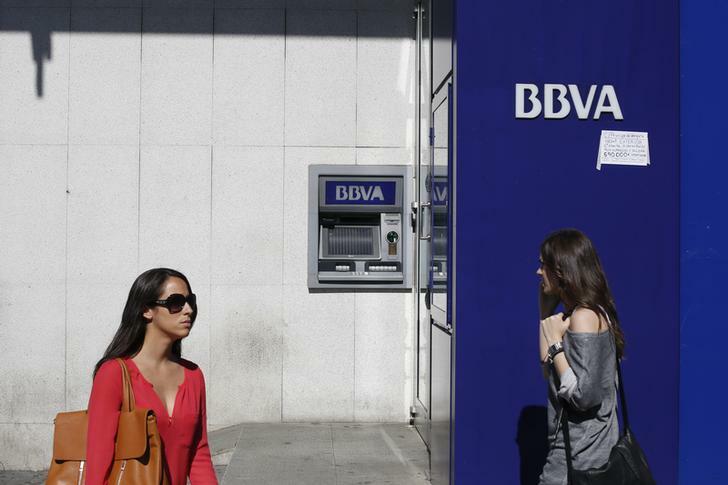 BBVA beat rivals Santander and Caixabank to win the auction of bailed-out Catalunya Banc with an offer of 1.2 billion euros, a 47 percent discount to book value. The deal will double the Spanish bank’s market share in Catalonia, one of the richest regions in Spain. BBVA said it expected synergies of 1.2 billion euros and the deal to contribute to earnings by 2016. Its core capital ratio, which stood at 10.8 percent in March (a Basel III core Tier 1 ratio of 9.9 percent), will fall by 55 basis points. Spain’s bank restructuring Fund, the FROB, had tried twice to sell the troubled Catalan bank. The sale comes after Catalunya Banc sold a portfolio of toxic mortgages with a face value of 6.4 billion euros to Blackstone. The FROB agreed to reduce the purchase price by 267 million euros if fiscal authorities haven’t confirmed the treatment of deferred tax assets by the time the deal closes in the first quarter of next year. At 1010 GMT, BBVA shares were up 1.9 percent to 9.1 euros a share, outperforming the Spanish market.